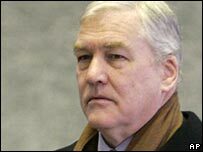 Media tycoon Conrad Black has pleaded not guilty to four new charges linked to allegations he plundered millions from Hollinger International. At a court in Chicago, the former Daily Telegraph owner denied charges of racketeering, obstruction of justice, money laundering and mail fraud. Lord Black and three executives denied allegations they diverted almost $84m (£49m) from newspaper group Hollinger. At the latest hearing, district judge Amy St Eve set a trial date of 5 March. The latest charges were levelled against Lord Black on Thursday. The peer has already pleaded not guilty to eight charges of fraud. Co-defendant John Boultbee was also charged with a second count of fraud on Thursday, which he also formally denied. By charging Lord Black with racketeering - which means engaging in an ongoing criminal enterprise with his co-defendants - prosecutors can demand stiffer sentences, penalties and allow courts to confiscate his assets. The racketeering charge alleges that Lord Black oversaw a number of newspaper sales which enriched him and other Hollinger executives. Meanwhile, the charges of money laundering and wire fraud relate to claims that Lord Black illegally transferred $2.15m in fraudulently-obtained proceeds from the sales to a company bank account which was used to buy an apartment in New York. The media tycoon is also accused of removing boxes of documents from his companies' Toronto offices. In November, Lord Black and three former Hollinger executives were charged with 11 counts of fraud in the US, linked to a $2.1bn (£1.2bn) sale of hundreds of Canadian newspapers. The additional charges now mean that if found guilty, Lord Black could now face a maximum of 95 years in jail and a $7m fine. Lord Black's Canadian lawyer said the new charges were a "blatant example of over-reaching" by federal prosecutors. "Mr Black asserts his innocence without qualification... (and) has, at all times, acted in good faith," Edward Greenspan said in a statement.